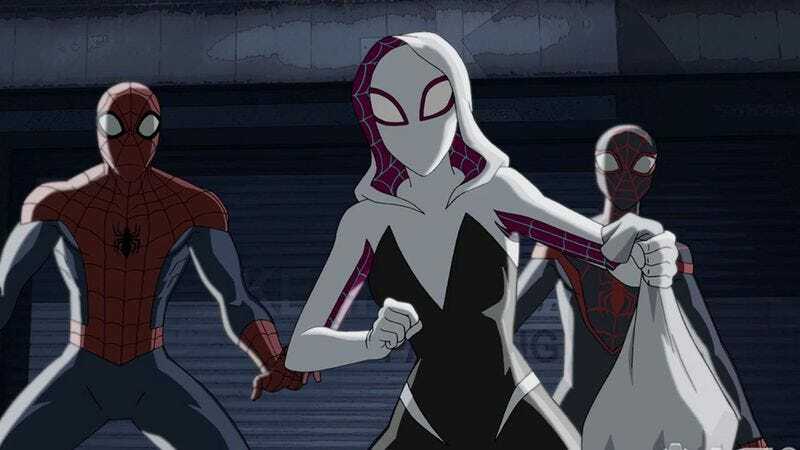 While Spider-Man: Homecoming deals with the fallout of even suggesting that Zendaya could be Mary Jane Watson, Disney XD’s Ultimate Spider-Man series is preparing for the arrival of Spider-Gwen. When the animated webslinger swings back into action this Saturday, he’ll be going back up against the Sinister 6 as part of the “Return To The Spider-Verse” arc. This four-part storyline sees Peter Parker teaming up with Miles Morales, who’s been coming across a lot of alt-reality Spider-Men (Mans? ), including Earth-65’s finest. Voiced by Dove Cameron (The Descendants), Spider-Gwen will appear in the final episode of the arc, which will mark the character’s first appearance in an animated series. She was first conceptualized by Dan Slott, and made her debut in Edge Of Spider-Verse #2. But she was such a hit with fans that Marvel launched the Spider-Gwen comic-book series in February 2015. The monthly book was created by Robbi Rodriguez and Jason Latour, who also serve as artist and writer of the series, respectively. Spider-Gwen will be one of the many spider-powered individuals that Peter and Miles encounter in this arc, including pirate and cowboy Spideys. “Return To The Spider-Verse” will also feature the return of Spider-Man Noir (Milo Ventimiglia), as well as cameos from Rocket Raccoon and Howard The Duck. The four-parter kicks off August 27 on Disney XD.